NewYork-Presbyterian Hospital in New York City is ranked number one in the New York metropolitan area by U.S. News and World Report. The health system is comprised of four main divisions, including NewYork-Presbyterian Hospital, NewYork-Presbyterian Regional Hospital Network, NewYork-Presbyterian Physician Services and NewYork-Presbyterian Community and Population Health. NewYork-Presbyterian is also affiliated with the Columbia University Vagelos College of Physicians and Surgeons and Weill Cornell Medicine. NewYork-Presbyterian Enterprise consists of 10 institutions. The core hospitals are Columbia, Weill Cornell, Allen, Lawrence, Lower Manhattan, CHONY and Westchester. The regionals consist of Brooklyn Methodist, Hudson Valley and Queens. NewYork-Presbyterian’s biomed department is made up of 72 members and the imaging team includes another 15. The hospitals include 2,600 beds, 16 MRIs, 23 CTs, 140 portables and 40 special procedure labs. “The director of biomed reports to the vice president of IT (CTO),” says Christopher Schaefer, manager of diagnostic imaging. “Reporting to the director are four departments (general biomed, imaging, planning and performance excellence [policy]). General biomed is comprised of a union team (40 at Columbia campus) and a non-union team (32 at Cornell campus). Imaging is comprised of a union team (eight at Columbia campus) and a non-union team (seven at Cornell campus). The planning team (five) and policy team (four) round out the biomed department that supports over 140,000 pieces of equipment,” Schaefer says. The department currently services magnetic resonance, computerized tomography, nuclear medicine, X-ray, rad fluoro and portables, ultrasound, mammography and special procedures (EP Labs/Cath Labs). There are a few devices the department does not currently service. “NewYork-Presbyterian imaging pays for the vendor service agreements for radiation oncology (linacs, simulators), but the radiology/oncology department has their own vendor-trained engineers,” Schaefer says. With a large inventory of cutting edge technology, how does the team keep abreast of training? “We employ, whenever possible, shared service agreements with the OEMs, where our imaging team provides first call and PMs on the covered equipment,” Schaefer says. “The OEM training for the engineers to qualify is funded by full-service agreement discounts and annually renewable training dollar pools. Backups are preliminarily trained through on-the-job training working with the primary engineers. Regardless, the hospital’s CIO is very supportive of training,” he adds. The imaging group is also involved when it comes to buying equipment. “The imaging team signs off on all equipment purchases and capital requisitions, as ultimately we are responsible to maintain, whether by managing vendor or in-house team or a combination of both,” Schaefer says. He says that the imaging specialists attend planning meetings and are involved with the imaging equipment clinical acceptance process. “Equipment contracts are overseen by a combination of legal, procurement and imaging. Being responsible for the maintenance of the imaging equipment, we have developed our own parts sourcing when vendors are not obligated by contract,” Schaefer adds. He adds that the team has negotiated operational training pools with the major vendors (separate from technical training pools) to be implemented at their discretion. “Being affiliated with two reputable medical schools – Cornell and Columbia – our imaging equipment tends to be more of the latest and greatest,” Schaefer says. “OEM service contracts are more applicable (for us) then third-party. In-house members of the imaging team are fully vendor trained on magnetic resonance, computerized tomography, nuclear medicine, X-ray, rad fluoro and portables, ultrasound and special procedures (EP labs/cath labs). Whenever equipment is upgraded, different training is employed to maintain competency,” he adds. A big focus of the imaging team has been to find ways to maximize equipment up-time beyond the industry standard. The imaging team has taken a leadership position in faster response times and minimizing patient inconvenience. “Most recently, the shared service project (GE, Siemens, Philips and Carestream) took up most of our spare time. Currently, we are working on expanding that so that the expertise of our imaging specialists can be available to all 10 NewYork-Presbyterian locations on-demand via equipment remote access, with only one imaging engineer at each of the eight locations not supported by an in-house imaging team. The imaging teams are involved with joint effort research projects between GE, Philips and Siemens,” Schaefer says. Schaefer adds that being affiliated with two teaching institutions, NewYork-Presbyterian is being exposed to new clinicians and doctors annually. OEMs typically perform operational training the first year new equipment is installed, leaving it up to the hospital to train new employees. By negotiating training pools into the service agreements with the vendor, all students can be exposed to encompassing imaging training every year. “Complying with our need to put patients first, enhancing our shared service program to the point that GE co-authored a white paper with NewYork-Presbyterian on the subject, was a major step forward,” he says. “Typically when a problem occurs on a major imaging device, the patient has to be moved due to the industry standard of a vendor two- to four-hour response time,” Schaefer adds. He says that with shared service, the patient does not necessarily have to be moved, the two- to four-hour response downtime is minimized. He also says that out-of-contract overtime costs can be reduced, full-service contract cost is reduced with no down side and there is more flexibility in scheduling PMs on high-usage equipment. 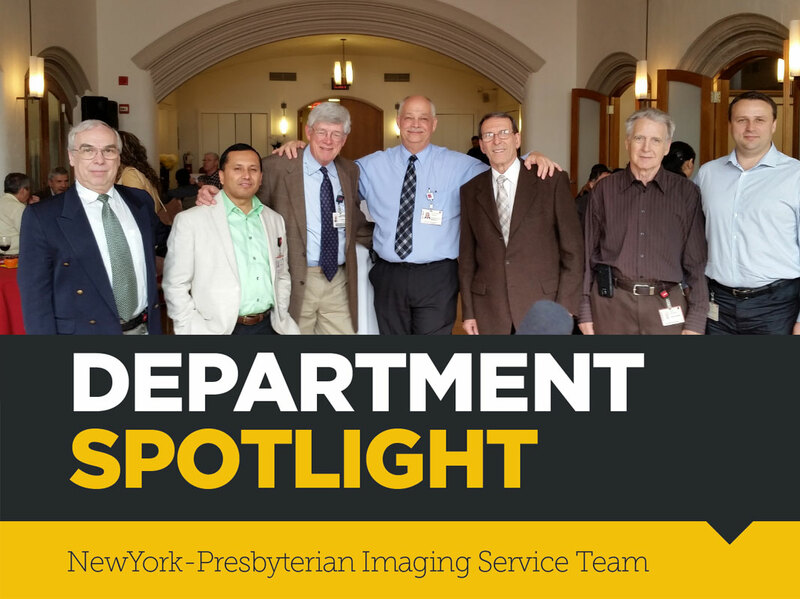 The NewYork-Presbyterian imaging team is leading the way in strategically planned imaging service. Why should this department be featured in ICE Magazine?